Three harrowing shark tales of survival against all odds! In Open Water, two ocean divers are left stranded in shark infested waters when their scuba expedition leaves them behind. Now they must fight to stay afloat and stay alive. 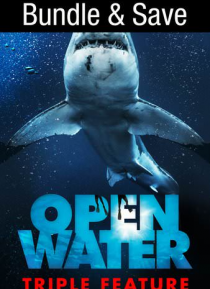 In Open Water 2: Adrift, a weekend aboard a luxury yacht goes awry when a group of friends forget to lower the boat ladder before jumping into the ocean for a swim. The… boat is impossible to climb and leaves them adrift miles from shore. In Open Water 3: Cage Dive, three friends set out to film an audition for an extreme reality show. But a catastrophe leaves them in shark infested water and turns their audition into a survival diary.